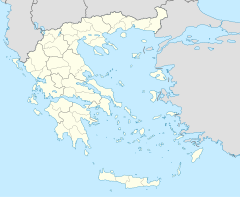 For the current railway station in Corinth, see Corinth railway station. The former Corinth railway station (Greek: Σιδηροδρομικός Σταθμός Κορίνθου, Sidirodromikos Stathmos Korinthou) was on the former metre gauge Piraeus, Athens and Peloponnese Railways (Piraeus–Patras railway). The Piraeus, Athens and Peloponnese Railways reached Corinth in July 1884. Some parts of the station date from 1916 and 1929, and the main building, designed by architect Anthony Dragoymi (Greek: Αντώνη Δραγούμη), was built in 1955. The station closed to regular traffic on 9 July 2007, having been replaced by a new station on the new line, but is currently used by tourist excursion trains. ^ "Corinth railway station (in Greek)". Δήμος Κορινθίων (Corinth Municipality). Retrieved 30 July 2013. ^ "Revive memories of the old Corinth railway station (in Greek)". Kartson.blogspot. 14 April 2013. Retrieved 30 July 2013. Wikimedia Commons has media related to Korinthos train station. Corinth railway station Photo on Panoramio. This article about a Greek railway station is a stub. You can help Wikipedia by expanding it. This page was last edited on 28 June 2018, at 16:20 (UTC).